How many times can you pirouette on your feet without keeling over? A dozen times? 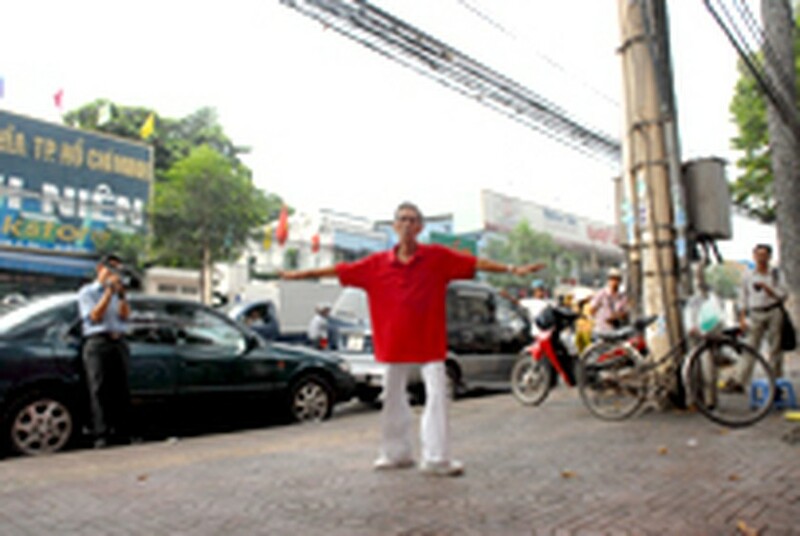 A 72-year-old in Ho Chi Minh City spins around several thousand times every day without falling over. During Lunar New Year (Tet) last year, Tran Minh Thiem did 7,000 spins in three hours to everybody’s amazement at the Pensioner’s Club in Tan Binh District. A teetotaler and vegan, Thiem, in fact, does a few hundred every morning as a kind of physical and mental exercise. By doing so, he claims, he can absorb energy from the universe and a Buddhist sutra he chants can ward off psychosomatic illnesses. He began his unusual pursuit when he was just 11 or 12 years old. In his early 30s he got interested in it again when he saw European figure skaters performing in then Sai Gon (now Ho Chi Minh City), pivoting marvelously on their feet. Thiem began to practice and soon could do several hundred spins. “I became addicted,” he confesses. But marriage followed and his wife was less than thrilled about his pirouettes, afraid he may get hurt. So he stopped for almost 20 years until, one day, an old friend suddenly paid a visit and told him about Tibetan methods of “charging the body with energy” by spinning around. But one had to gradually get used to it, the friend warned, by starting at a gentle pace. The next morning he did 500 spins before his friend and a group of goggle-eyed youths who admitted they themselves could only do 50 despite having practiced for several months. Now, after finally getting his wife’s assent, he practices daily on the balcony of his house at 192 Tan Ky, Tan Phu District. He also performs at public gatherings, weddings, and parties. Sometimes he holds balls or paper fans in both hands while displaying his formidable skills. It is not known how he manages to stay on his feet and not get dizzy. The body’s balance is in the inner ear and rapid spinning upsets the equilibrium. People with inner-ear problems often have bouts of dizziness, a condition known as vertigo. Ballet dancers use a technique called “spotting”, or focusing the eyes on a reference point. That is, soon as they whip their head around each time, they go back to staring at this point. Asked about the secret of his health, Thiem says that he “pays special attention to the mouth”. He does not eat or speak too much since the ancients have “taught us diseases enter through the mouth and disaster comes out of the mouth”. “I having been a vegan for over 40 years, and despite looking thin I am not by any means weak,” he says. Vietbooks, a Vietnamese Guinness records organization, is considering an entry about the person “who can make the most spins”.